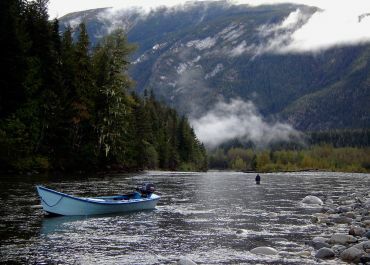 The Dean River begins as a small stream high in the swamps of the Chilcotin plateau of British Columbia's interior. It flows north through the well-known wild Rainbow trout fishing area around Nimpo and Anahim Lakes then turns westward at Anahim Peak and begins it's turbulent descent to the Pacific Ocean. Natural barriers in this middle section concentrate a large summer run of Steelhead (sea run Rainbow trout) in the lower reaches of the river from June through September. 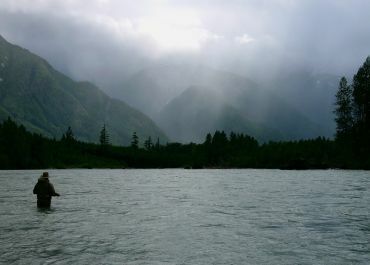 A canyon near the mouth of the river keeps the weaker salmon out of the system. 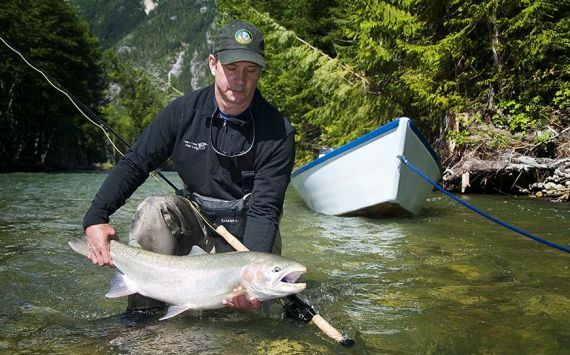 Only Steelhead, Chinook and Coho get through in significant numbers. Chinook Salmon enter the river through June and July and Coho Salmon enter late August through September. 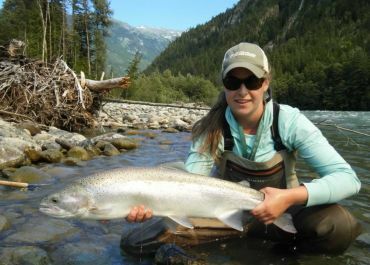 The Dean is a dry fly paradise for steelhead from the day it opens to October 1, the day the river closes.